The Aldbourne Cup is an unusual early Bronze Age (c. 1700-1500 BC) small ceramic cup with a lid. It was discovered in 1878 by Canon William Greenwell in a barrow or burial mound 1½ miles north-west of Aldbourne. The site is about 100 yards from the B4192 and just below the well-known Four Barrows. A second cup, without a lid, was found in the same barrow. 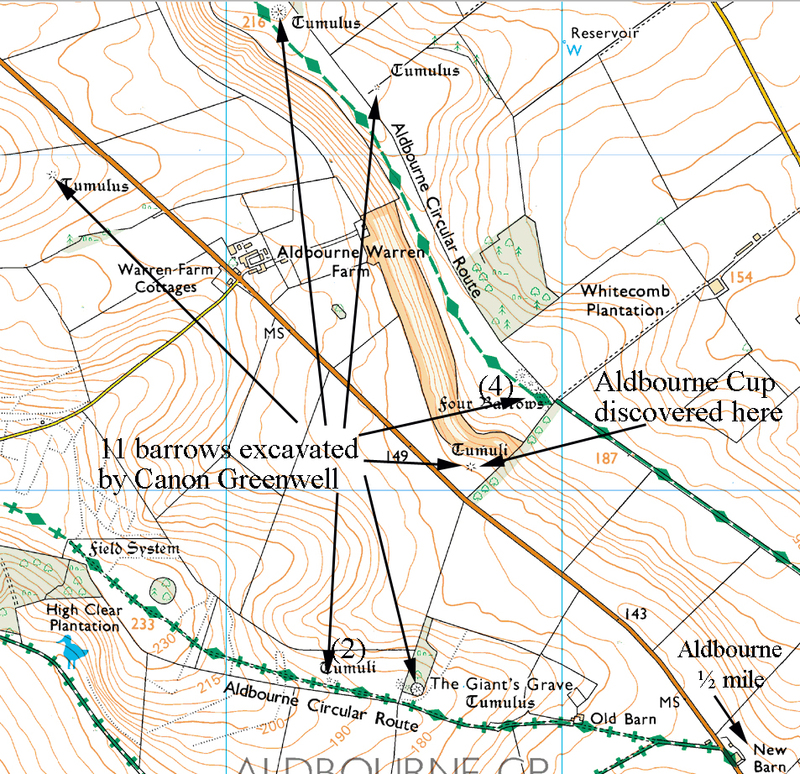 The precise purpose of the Aldbourne Cup is not known. There are holes in both the cup and the lid, which rules out the possibility that it was a drinking cup. The most likely reason for the holes is that they were needed to suspend the cup, with the lid attached, using some kind of twine. 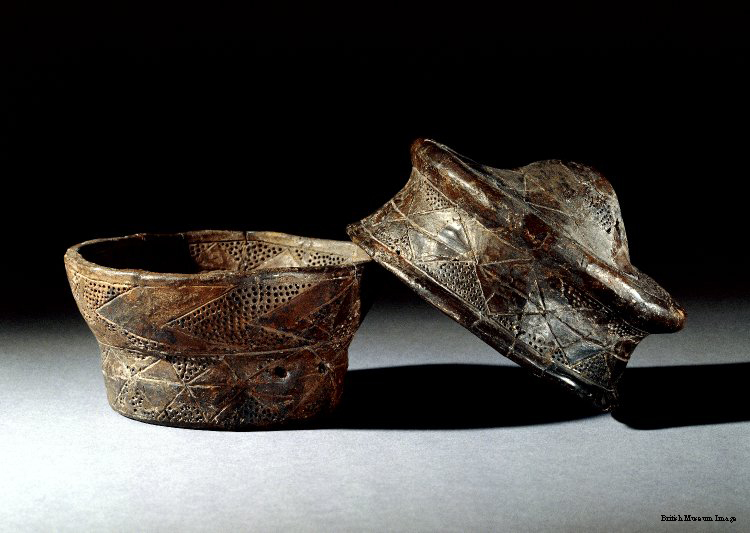 The cup was almost certainly used as an accessory to the cremation at the barrow, and it is generally thought that it was used to contain material such as incense, as part of the ancient cremation ceremony. The cup and lid are finely decorated with different geometrical shapes – chevrons, diamonds and triangles. About half of the outside of the cup, as well as some of the inside, contains pointillé (stippled) decoration made by a very sharp object such as a pin repeatedly inserted into the soft clay. It is a feature of the decoration pattern that this stippled decoration is never applied to adjacent shapes. 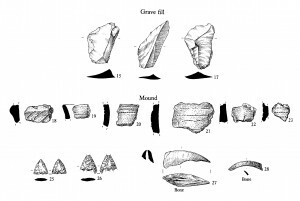 Only 8 or 9 cups of a similar type have been found in total, all of them in Wiltshire and the immediately surrounding area. None of the other cups have lids, and none are as finely decorated as the Aldbourne Cup. However, cups of this type are now routinely referred to as “Aldbourne cups” irrespective of where they were found, and despite the fact that most of them were found before the discovery of the Aldbourne Cup. 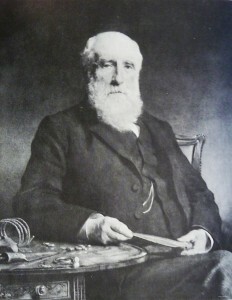 William Greenwell (1820-1918) was a Canon of Durham Cathedral, the Cathedral’s librarian and archivist, a Fellow of the Royal Society, and a JP and alderman of the County of Durham. 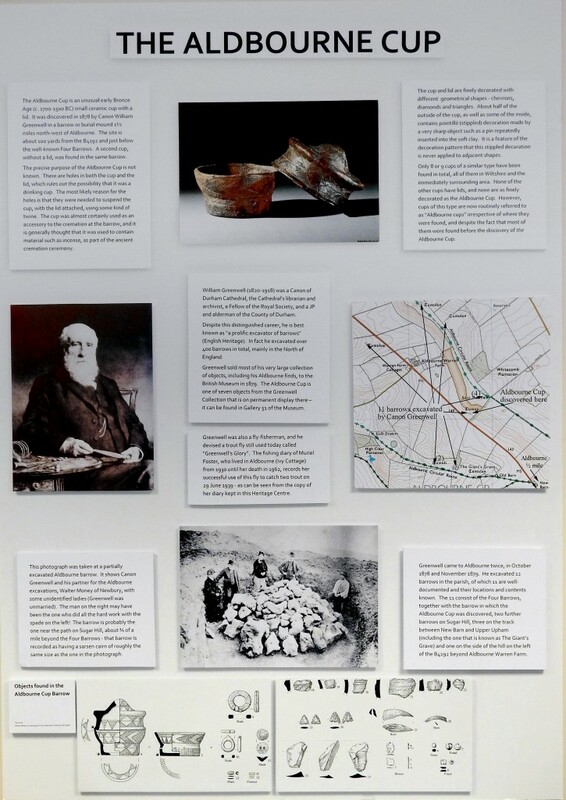 Despite this distinguished career, he is best known as “a prolific excavator of barrows” (English Heritage). 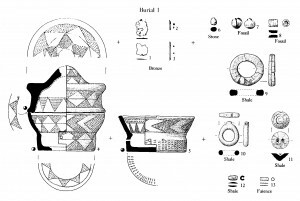 In fact he excavated over 400 barrows in total, mainly in the North of England. Greenwell sold most of his very large collection of objects, including his Aldbourne finds, to the British Museum in 1879. The Aldbourne Cup is one of seven objects from the Greenwell Collection that is on permanent display there – it can be found in Gallery 51 of the Museum. Greenwell was also a fly-fisherman, and he devised a trout fly still used today called “Greenwell’s Glory”. The fishing diary of Muriel Foster, who lived in Aldbourne (Ivy Cottage) from 1930 until her death in 1962, records her successful use of this fly to catch two trout on 29 June 1939 – as can be seen from the copy of her diary kept in this Heritage Centre. This photograph was taken at a partially excavated Aldbourne barrow. It shows Canon Greenwell and his partner for the Aldbourne excavations, Walter Money of Newbury, with some unidentified ladies (Greenwell was unmarried). The man on the right may have been the one who did all the hard work with the spade on the left! The barrow is probably the one near the path on Sugar Hill, about ¾ of a mile beyond the Four Barrows – that barrow is recorded as having a sarsen cairn of roughly the same size as the one in the photograph. Greenwell came to Aldbourne twice, in October 1878 and November 1879. 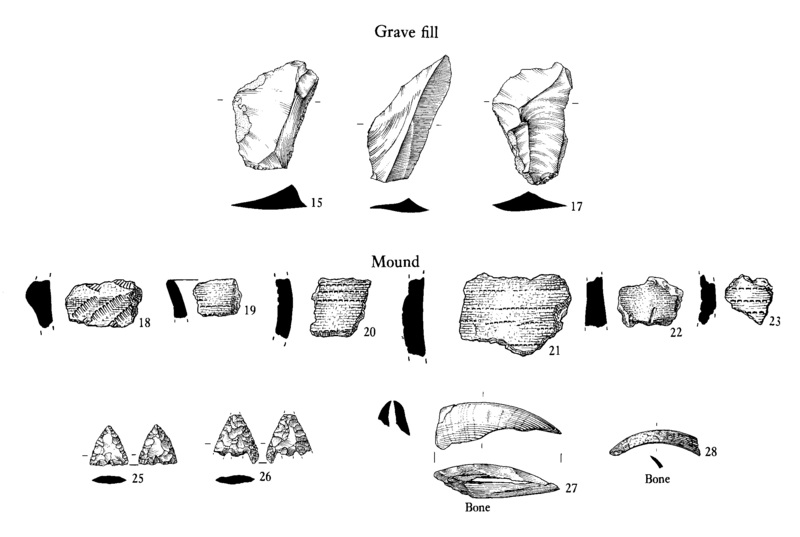 He excavated 12 barrows in the parish, of which 11 are well-documented and their locations and contents known. 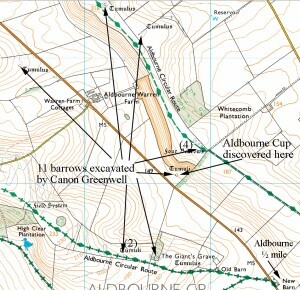 The 11 consist of the Four Barrows, together with the barrow in which the Aldbourne Cup was discovered, two further barrows on Sugar Hill, three on the track between New Barn and Upper Upham (including the one that is known as The Giant’s Grave) and one on the side of the hill on the left of the B4192 beyond Aldbourne Warren Farm. 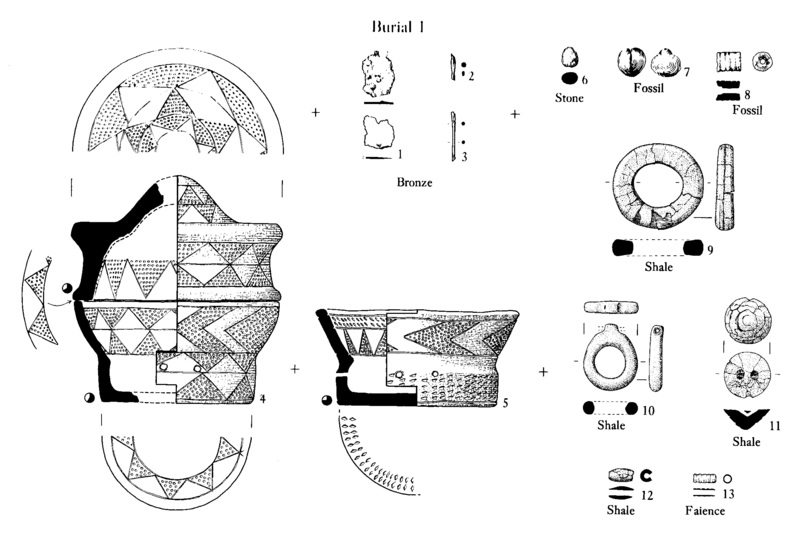 Here are drawings of the other objects excavated from the “Cup” barrow.